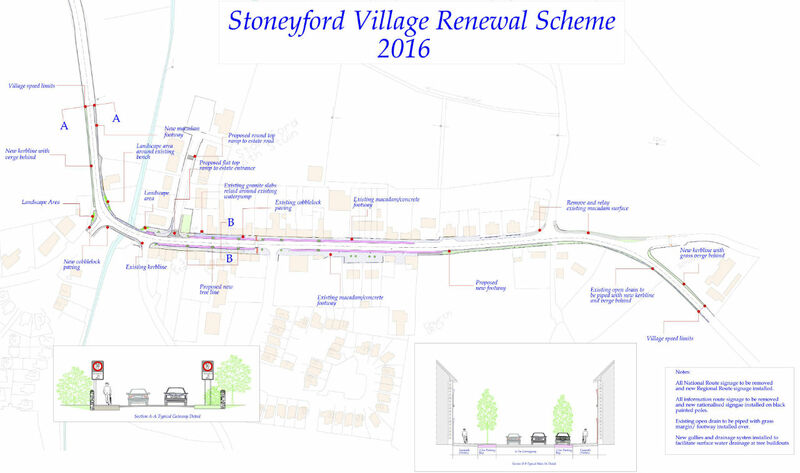 Tidy Towns Major Projects 2017 – Progress Report February - Stoneyford Development Association Village Renewal Scheme[/caption] Tidy Towns. Hedgerows: Following phone calls to landowners and notice in Parish Newsletter I am pleased to advise that all hedgerows have now been cut on Kilkenny Rd, Kells Rd, Noreland's Rd and Jerpoint Rd as well as in the village. Just hedge at Flood Memorial School to be done. Grass: Grass was cut at the Kilkenny Road today. Road margin grass reflectors secured last Saturday. Next Litter Pick: Saturday March 4th at 10.30am. Regina organising Posters from NTT website. Notification by SENS, Email, Newsletter, KP & Posters. Following extensive lobbying, our Kilkenny Area West representatives spoke extensively at last Friday's Municipal Council meeting in favour of the 2016 VRS (Village Renewal Scheme) 13 Point Plan (see attached) being advanced more quickly. Council Chairman/Cathaoirleach Cllr Matt Doran, Cllr Malcolm Noonan and Paddy McKee contributed extensively. They stated that Stoneyford had been let down in promises made by Council. In the meantime work is due to proceed immediately and finally at Merino Drive with the speed ramp being installed. Paddy McKee is following up council to acquire some planter tubs for us. Lobby for Footpath from village to Lawcus Lane and Bollards at top of Main St near Noreland's junction. CEES & TUS Schemes: Lobbying in hand for replacements for Martin Raggett & Paul Ryan. Plaque/Monument: Quotations being sought from SE Stone, Molloys Callan & Gargan's Friary St. Paschal and myself visited Molloy's & Gargan's today. Final wording to be agreed. Design to be agreed. Flag Poles: Awaiting quotation and design from Stoneyford Engineering. Carrickshock GAA: Spoke with Chairman Tommy Murphy re new All Ireland Intermediate Hurling Champions partaking in Parade. Positive response. Other local groups welcome. Awaiting confirmation from Church of Ireland, High Nelly Cyclists, Evelyn White, Military Colour Party and Padhraic Moran. Suggestions and requests all very positively received. Confirmations received from Fr Liam Cassin, St Patrick's Brass Band, Cllr Matt Doran & Kathy Ryan re Refreshments. Traditional musicians required for 30/45 minutes. Field Names Project: Met with Jimmy Sheehan. Good progress made. On-going work. Ennisnag/Lawcus Bridge: Pat Phelan funding a survey to be carried out on bridge regarding restoration/repair work. Urgent repairs required to Bridge and Old Village Well. Remove Ivy from Hogg's Lime Kiln. Heritage Board: I am continuing to work on editorial content. Harry Reid undertaking photography free gratis. Quotations being sought for graphic design. Looks like we may have to go to a green field site for new Board. Village Entrance cast iron signs: Quotations being sought from Athy Foundry (specialists). Heritage Week: I am working on content for an extended Village Walking Tour during Heritage Week in August. Odd Photos required of Village and its people for Exhibition at CC during Heritage Week. Signs: Village Entrance Signs and Schoolhouse Lane. Street Furniture: Acquire old Telephone Kiosk & Post Pill Box. Village House Numbers & Names Project: Acquire original names, previous occupiers and current names of families. Walking Trail. Pat Phelan working very closely with KLP Trails Office Harry Everard on developing Mullins Mill to Merino Factory Trail. Many hurdles overcome. School Green Flag Programme: Underway. Sustainable Waste Management & Biodiversity. A strategy and plan needs to be devised here with input from experts in this field. Japanese Knotweed & Himalayan Balsam. Solution needs to be found for this infestation at Ennisnag. DIY Fix It Team -Odd Jobs. Steps at Stream, Replace Bin on Street, Lamps for Petrol Pumps, Clean Up front of Derelict School, Ennisnag Farm Ruin and Dedicate Seat, Painting Jobs. Communications: Website and Facebook being updated regularly by Conchubhar & Kathy respectively. I am preparing a suite of sponsorship package options based on planned projects. Hedgerows: Following phone calls to landowners and notice in Parish Newsletter I am pleased to advise that all hedgerows have now been cut on Kilkenny Rd, Kells Rd, Noreland’s Rd and Jerpoint Rd as well as in the village. Just hedge at Flood Memorial School to be done. Following extensive lobbying, our Kilkenny Area West representatives spoke extensively at last Friday’s Municipal Council meeting in favour of the 2016 VRS (Village Renewal Scheme) 13 Point Plan (see attached) being advanced more quickly. Council Chairman/Cathaoirleach Cllr Matt Doran, Cllr Malcolm Noonan and Paddy McKee contributed extensively. They stated that Stoneyford had been let down in promises made by Council. Lobby for Footpath from village to Lawcus Lane and Bollards at top of Main St near Noreland’s junction. Plaque/Monument: Quotations being sought from SE Stone, Molloys Callan & Gargan’s Friary St. Paschal and myself visited Molloy’s & Gargan’s today. Final wording to be agreed. Design to be agreed. Awaiting confirmation from Church of Ireland, High Nelly Cyclists, Evelyn White, Military Colour Party and Padhraic Moran. Suggestions and requests all very positively received. Confirmations received from Fr Liam Cassin, St Patrick’s Brass Band, Cllr Matt Doran & Kathy Ryan re Refreshments. Traditional musicians required for 30/45 minutes. Ennisnag/Lawcus Bridge: Pat Phelan funding a survey to be carried out on bridge regarding restoration/repair work. Urgent repairs required to Bridge and Old Village Well. Remove Ivy from Hogg’s Lime Kiln.